Stephanie, the owner of Green Baby Bliss started this wonderful company shortly after becoming a Mommy. This is what she says: "Through the process of locating the best manufacturers I am delighted to find many wonderful small businesses and companies that had made it their goal to produce creative and high quality products. These are the products that are TRULY "best" for baby. All products and brands sold on Green Baby Bliss are specifically chosen for a reason and even tested on my own little one! We offer a variety of recycled wooden and organic cotton toys to cloth diapers, organic bedding and clothing, even safe baby skin care products. I am extremely excited to share these gifts with families across the United States. Let's make it our goal to raise happy, healthy, blissful, green babies together!" Thanks to Stephanie, Dexter now has the cutest new Baby Soy outfit. Look at how charming he looks in it! This outfit is described perfectly on Green Baby Bliss' Site: "The eco-friendly Soy fiber provides a luxury of comfort during the cooler days. Its natural moisture transmission quality also helps keep babies warm and dry. The perfect combination of comfort and style! This highly-demand baby pocket tee allows for quick and easy outfit creations (matches perfectly with Baby Soy pants). Eco-friendly soy fiber provides a luxury of comfort during the cooler days with its superior warmth retention characteristics. Its natural moisture transmission quality also helps keep babies warm and dry. A perfect baby tee for your perfect baby!" Green Baby Bliss not only carries adorable clothing but they also carry toys, cloth diapers, baby carriers and so much more! Thanks to Stephanie, I have a delicious giveaway for you! 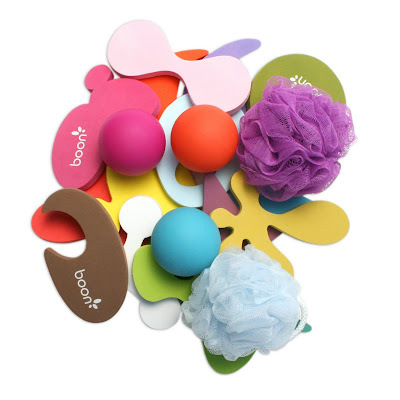 One lucky DSSM reader will win a whole bunch of awesome Boon Bath Toys! The winner will receive the following prizes worth $33! New from Boon. 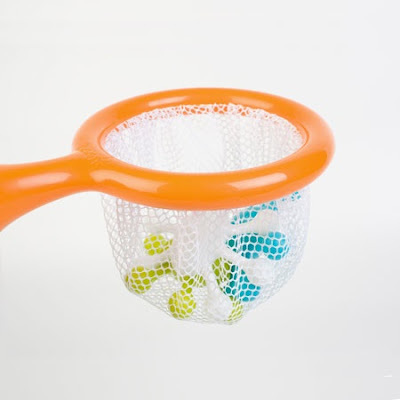 Bath time is much more fun with these floating bugs and a net for catching in the tub! 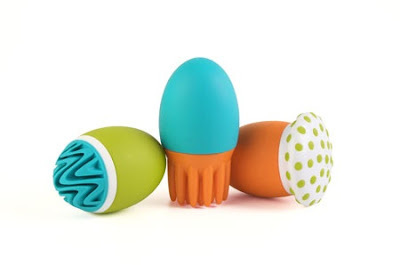 Best of all they are BpA, Phthalate and PVC free! Your kids can practice scrubbing in the tub with this set of three interchangeable bulbs and textured attachments. Best of all they are BPA, Phthalate and PVC free! The perfect safe bath toy for your little one. My daughter and niece would love the Green Toys Tea Set. I commented on your handsome sons pics in his children's place clothes. Like the planet pixies Anyu doll. I like the Plan Toys Shaper Sorter! The Plan Toys Animal Domino game looks like fun! My son would love the Green Toys Dump Truck. Green Toys indoor Gardening kit is perfect. Love recycled toys at Green Baby Bliss. I really like the Plan Toys Shaper Sorter. This would keep my little one busy. I made a comment on the other post you sent me over to. I'd love the Green Toys Cookware and Dining Set for my daughter! I love how this store is set up - the "categories" are so cute! "Carry me," "time to play," etc. As an expectant mom of my second, I'm def. coveting the BPA-free bottle sets. I donated all of our old bottles as I wanted to move to glass, but now I have to start all over! Our favorites are the Flo and the Ring Toss! Oh, I love the Green Toys Cookware and Dining Set! I can't wait till my littlest one is ready for all that girl stuff! I commented on my favorite pic of your boy. He is precious! I'm lovin the Kate Quinn Organic Peter Pan Dress. The kimono dresses are pretty cute too. Oooo I love the Green Toys cookware set - how cute!! I love the Plan Toys Riding Henry! So cute! I love the planet pixie Maia doll! So precious! Thanks for the giveaway. H would love to have the green tea set to drink tea with mommy! I love the Green Toys cooking and dinnerware set!! I commented on the clothing post. That is one well-dressed little pumpkin!! I like the Kate Quinn and Baby Soy organic clothes for my little one. I wish i could afford them cause i felt a baby soy blanket one time and it was amazing!! Green Toys Recycling Truck. My daughter would love this. wow, what a great store! I love the Green Toys Tea Set for my daughter! I commented on your adorable son in his cute outfits! I commented on the post about Dexters clothes. Green Toys Cookware and Dining Set is my choice. Thanks. We would love the Green Toys Dump Truck. Thanks for the giveaway. I absolutely love the Green Toys Tea Set. I always said I wasn't going to be "that kind" of mom raising "that kind" of daughter, and then I saw that tea set and decided I WANT to have tea parties. Every day. i really would like to try the water toys. I love all of their wooden toys! The Plan Toys Twisted Tossing game would be a hit at our place! I loved the Plan Toys Dancing Alligator & the Plan Toys Happy Engine!! I love all of the recycled baby items....what a fantastic concept. I also really like their BOON utensil products! This is so fabulous! Thank you! My son would love the Green Toys Recycle Truck. Thanks! Kate Quinn Organic Peter Pan Dress and the Kimono Dress are my favorites! Commented on your adorable boy's pics post! I would love to try the organic and bamboo sheets. I like Plan Toys Happy Engine. We like the Green Toys Recycling Truck. My favorite is the Green Toys Cookware and Dining Set. Thanks for the giveaway! Commented on Show and Tell Time post. I'm a new Twitter follower! Following you on blogger now too! I love the Green to Grow Welcome Home Bottle and Gift Set (Regular Neck)! I love wooden toys, and they have so many cute ones. If I have to choose, it would be the Plan Toys Bugs Balance Game. I love the New Native Organic Dusty Rose Twill Baby Carrier, it looks so comfy! I think this is neato: Green Toys Cookware and Dining Set! I like the Klean Kanteen 12 oz cup. So many great things! I think my daughter would have a great time with the Plan Toys Twisted Tossing game, it looks like so much fun for kids! i like the FuzziBunz Organic Cotton Changing Pad alot! Perfect with summer travels coming up. I love the Green Toys Tea Set made from recycled milk jugs, what a great idea.